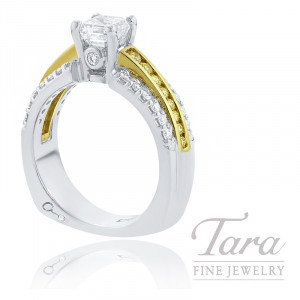 Tara Fine Jewelry Company is your Atlanta Rolex Dealer and expert jeweler specializing in the most stunning Designer Jewelry and Engagement Rings Atlanta has to offer. You've never seen radiance like this spectacular A. Jaffe 18k Yellow Gold and White Gold Asscher Cut Diamond & Fancy Yellow Diamond Ring! Home to beautiful A. Jaffe designs and the most beautiful selection of Diamond Engagement Rings in Atlanta, Tara Fine Jewelry Company is sure to become your favorite Atlanta Jewelry Store for luxurious Fine Jewelry. This wonderful A. Jaffe ring features the gorgeous two-tone look of shimmering 18k Yellow Gold and 18k White Gold. Enjoy the unique design of a raised inner row on the beautiful Diamond shank, as well as a flat bottom shank with A. Jaffe's signature "A" engraved. The ring flaunts 16 Fancy Yellow Diamonds at .30TDW and 24 glittering White Diamonds at .40TDW. For a special touch of glamour, the ring is beautifully paired with the eccentric beauty of a 1.00CT, G-VS1 Asscher Cut Center Diamond (sold separately). When it comes to unique design and grand brilliance, nothing tops this stand-out A. Jaffe Diamond Ring! 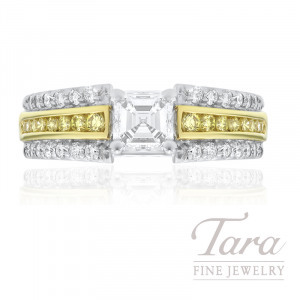 At Tara Fine Jewelry Company, an Atlanta jeweler with over 30 years of experience, you will find our luxurious custom jewelry designs and the most prestigious designer brands in the fashion world, including: Forevermark, Mikimoto, A. Jaffe, and Montblanc - to name a few. In addition to these exclusive brands, Tara Fine Jewelry Company is also your Official Atlanta Rolex dealer. Our luxury designer brands are sure to please all fine jewelry and watch connoisseurs! A. Jaffe Diamond Wedding Band, 1.12 CT TW.